Once thought extinct, dawn-redwood is native to Asia and is considered one of three conifers classified as redwoods (the others are the giant sequoia and coast redwood trees in the western United States). Capable of heights over 100 feet, dawn-redwood has a conical crown and a large straight trunk. Well-suited for long drives or streets, it can be found in urban areas and estates throughout Delaware. Dawn-redwood has flat leaflets arranged opposite one another. 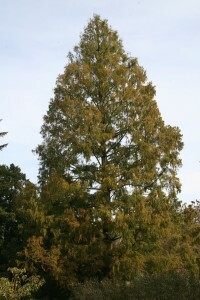 It is one of the few conifers to shed its needles during winter (the others are baldcypress and larch).